Welcome to Catherine Pooler's new Tropical Treasures release blog hop. 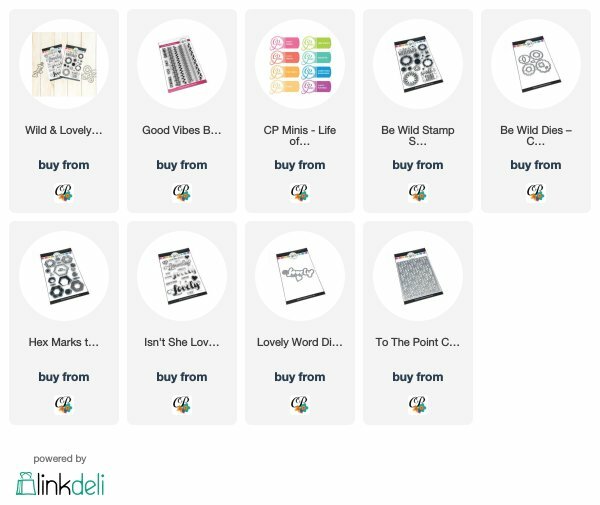 This is an amazing release with tons of new amazing products! The products went live in the Catherine's store yesterday at 9am EST! You should have arrived here from Karen's blog, but if you didn’t, you can find the whole blog hop list at the bottom of this post. And your next stop will be Daniel's blog. Next up is a card using the Isn't she Lovely set and dies and Be wild Set and dies. I like the effect on black, so used Midnight card stock for my background. 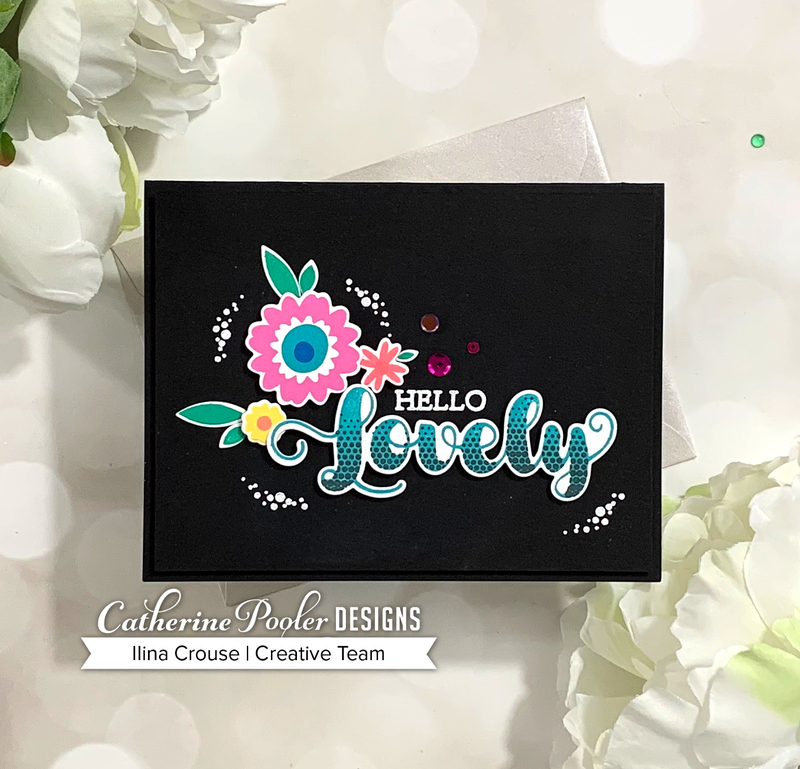 I stamped Hello and the little sprinkles with Watermark ink, then embossed in white. Stamped and die cut flowers, leaves and the Lovely sentiment. Assembled my card and added few sequins to finish it off. Last but not the least is a card using the Hex marks the spot set. 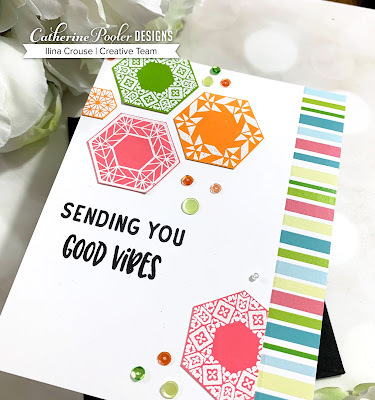 I made colored card stock by applying ink to paper directly, then stamped the hexagons with Watermark ink, embossed in white and cut them out. Stamped sentiment from Good Vibes border set and assembled the card adding a strip from Cabana Prints pattered paper pack. Added few sequins as finishing touch. Be still my heart!! Love all of your cards but that first one is my favorite. Gorgeous! I love the bright colors. 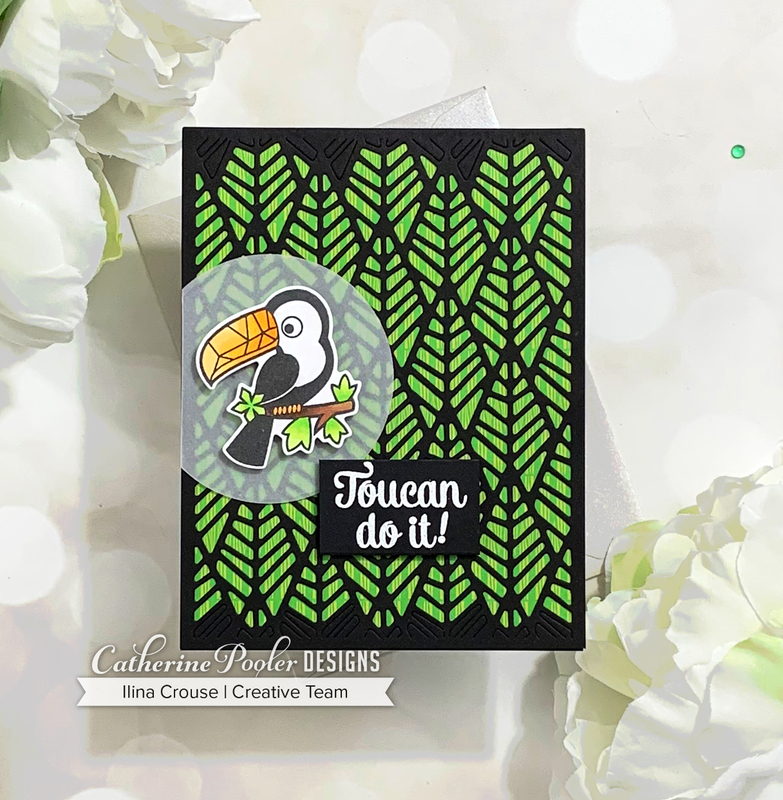 That die is the perfect backdrop for the beautiful toucan, the black background really sets off the sentiment and flowers on the second one, and I love the way you used those cool hexagons! Love them all but that second one is a stunner. Great cards, I am partial to the toucan card though. Good thing that is what I ordered this week. Beautiful cards, you done amazing job making them. 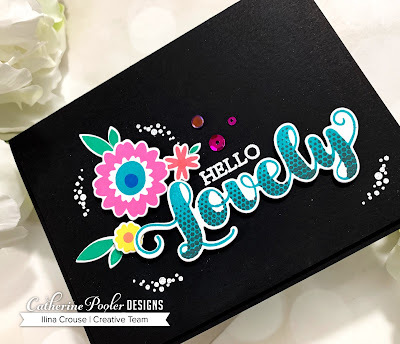 My favorite is second one just so impressed with this lovely stamp and die set. Thank you for sharing your awesome ideas. Love the cards! I really like the look of the bright colors done on the black background! Gosh, they are sure some awesome cards. All I can say is WOW!!! Just WOW! Great cards! 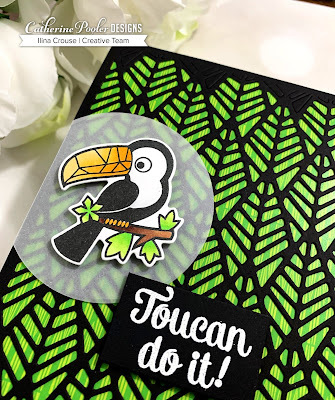 I love the black cover plate on top of the green paper and that cute toucan! Thanks for sharing. My favorite is the vibes card! Great cards...love the hex stamps. Are there dies too? HEX marks the spot is my fav! Great design! Awesome cards! I can't wait to get that hexagon stamp set! Your cards are Super! Love the cover plate. Love your cards! I really like how you went with the darker backgrounds - very creative! I like the vellum circle behind the bird. Great card ideas. I love all the cards, but the toucan is definitely the best! I love all of your cards. the birds are adorable and i love black backgrounds. thanks for sharing. Great cards ... I love the black on the first two! I couldn't love these more Ilina. The hexagon card is so gorgeous! Great use of color. Very striking. Great cards! Love using the vellum to highlight the toucan. I love the toucans and the hexagons! Such a great job! Love the colors! Wonderful and colorful card designs. My fave is the first one. I like all of your projects. I like the one on the black - really pops! Beautiful cards! I'm excited about this Tropical Treasures release! Love the birds, flowers and the awesome hex designs! Love all the inspiration we get to feast on every stop, thanks for sharing yours! I LOVE your cards! Just beautiful! Love the color combinations! Thank you so much for sharing!! Stunning cards!! I always love black + bright colors!! Amazing cards, Ilina! I love the black card bases!!! Wonderful cards!! Love this new tropical release!! Superb use of the tropical release. 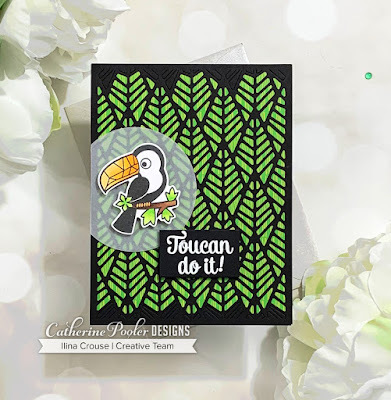 Your cards are stunning especially the first one as love toucans. Thanks for sharing your amazing talents. Love these cards, especially the lovely one using the black background. Makes the colors really pop and beautiful!! Wonderful cards. Such beautiful colors and amazing layouts. I love that cover plate! Such fantastic cards! Beautiful colors. Amazing. The black makes the design features POP! Loving the backgrounds! Lovely cards. I especially like the one on black. It is so striking. We don't see a lot of black cards so I'm in awe of yours. They are all so beautiful and I truly love your color combinations! Your use of black paper as base or die cut are stunning. I love the hexagon card. Lovely cards. Love all of the colorful cards! Such wonderfully striking cards! Fabulous designs and amazing inspiration.